If you’re like us, your daughter wants to eat pancakes for every meal. Like breakfast, lunch, dinner, snack, and midnight snack. If it comes with chocolate chips and agave, it’s even better (from her perspective). We actually had to reign her in because it was getting slightly out of control — and our pancakes are pretty healthy. 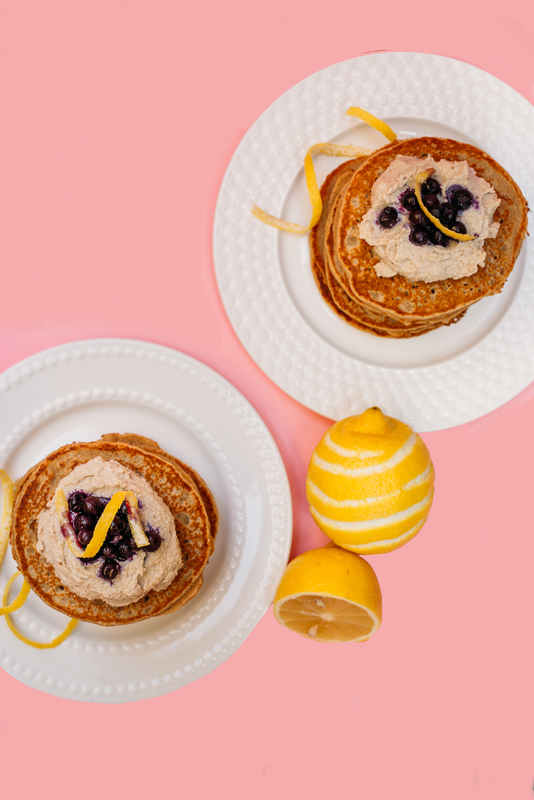 Our normal go-to quick and easy pancake is this 3-ingredient pancake recipe. 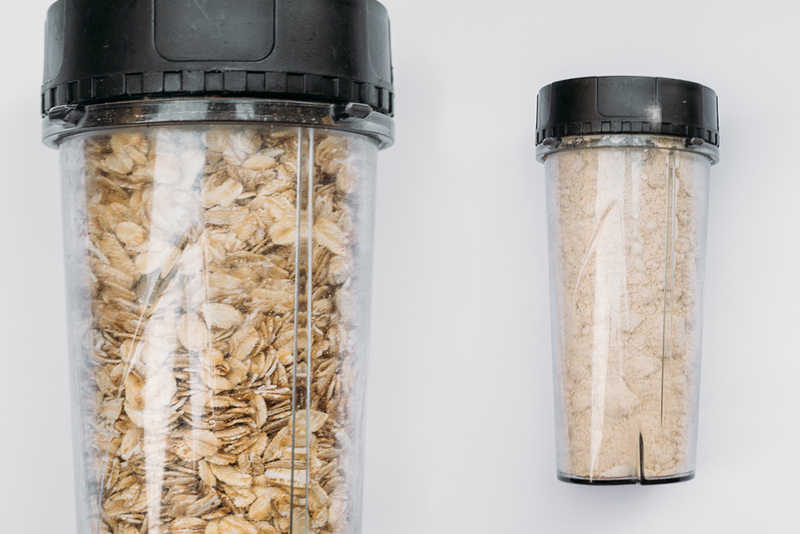 It’s super simple, packs nutrition, and you can have a whole batch in under 15 minutes. But every once in a while, we like to indulge in a pancake that’s a little more fancy. That’s where these guys come in. The base for these guys is ground oat flour, which takes less than a minute to make. 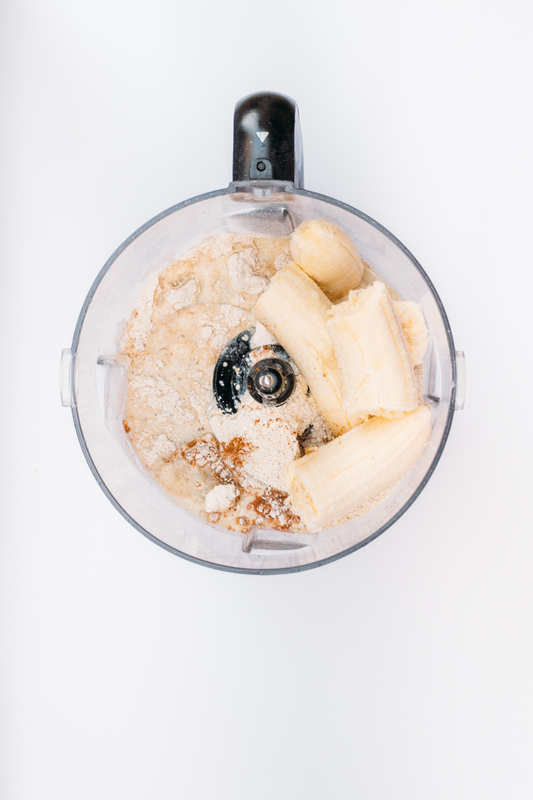 Just throw some rolled oats in your Ninja Blender or other food processor and blend for 15-30 seconds. 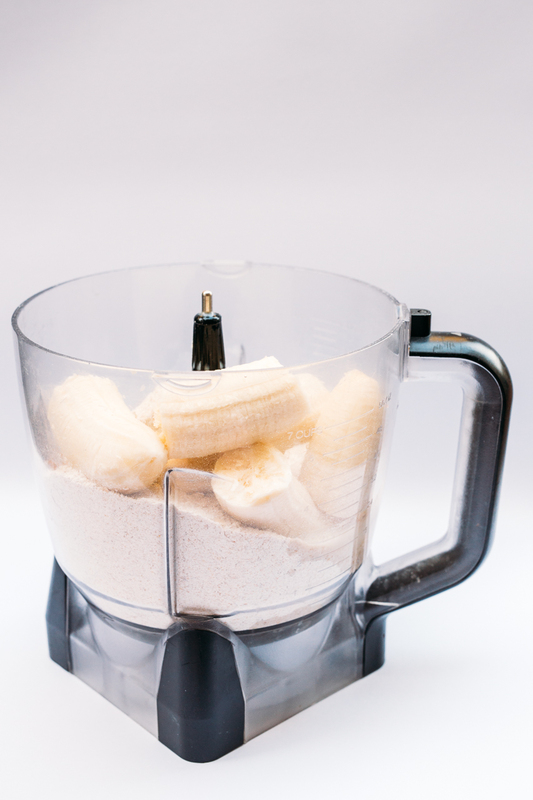 Add the oats and the rest of the ingredients into a bigger blender or food processor. We have the Ninja that uses the same base so it makes it super convenient. I highly recommend getting this if you make recipes from this blog because I use it ALL THE TIME. Turn your skillet onto medium-high and grease with a little coconut oil. Pour the batter into the skillet once it’s hot. I usually make them on the small-medium side, but you can make whatever size you want, just know the yield will be less. 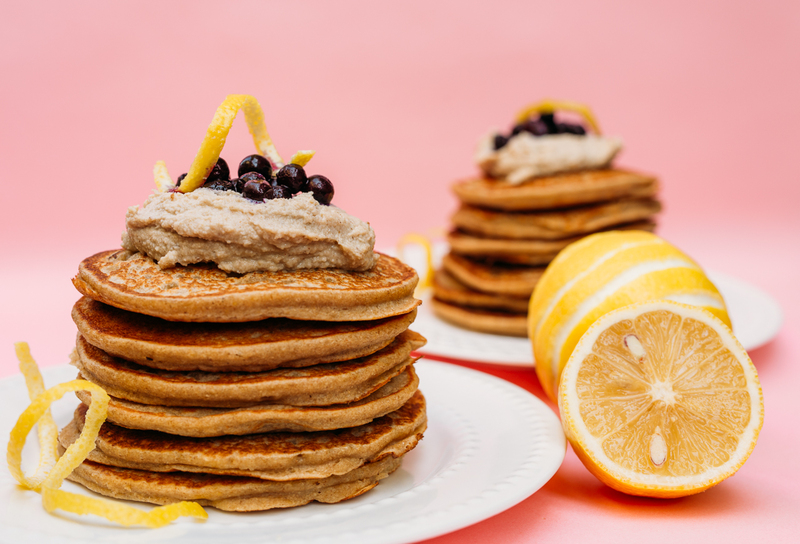 Cinnamon Pancakes with Lemon "Ricotta"
Place rolled oats into blender or food processor. Grind into flour. (I use the Ninja). 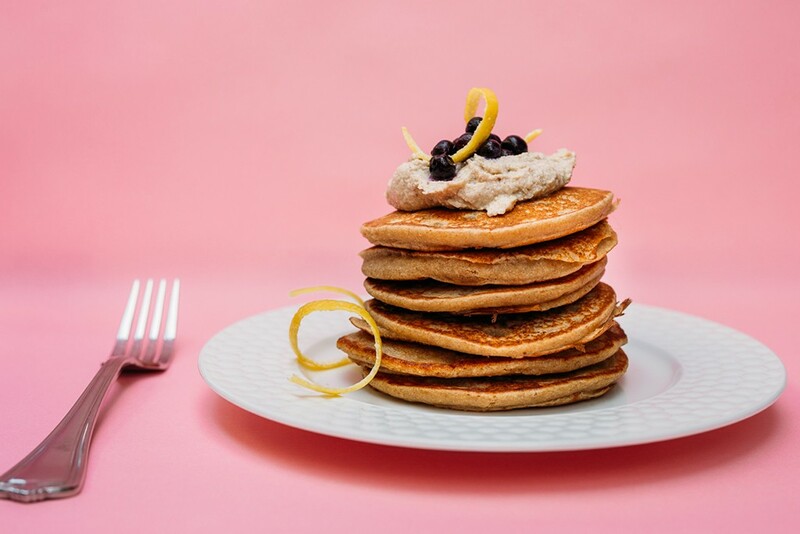 Put all ingredients for pancakes, including oat flour into food processor and blend until smooth. Grease skillet lightly with coconut oil and cook pancakes. Make the lemon ricotta by adding all ingredients into Ninja or blender and blend until smooth. 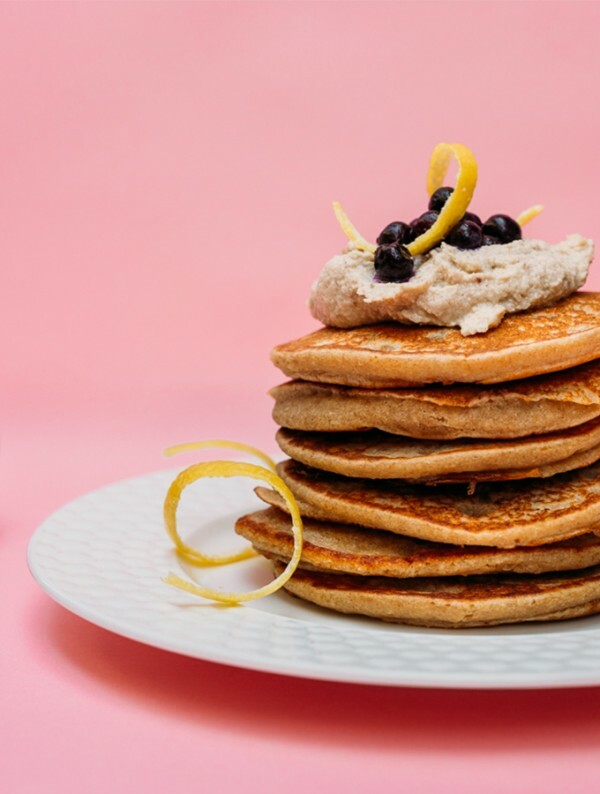 Take small pancake stack and top with a dollop of lemon "ricotta" top with blueberries and serve with maple syrup on the side. They are pretty sweet as is, so you might find you do not need much syrup! *Ideal to prepare Lemon Ricotta ahead of time and let it sit up in the fridge, the consistency will thicken up a bit with time. Serve at room temperature. 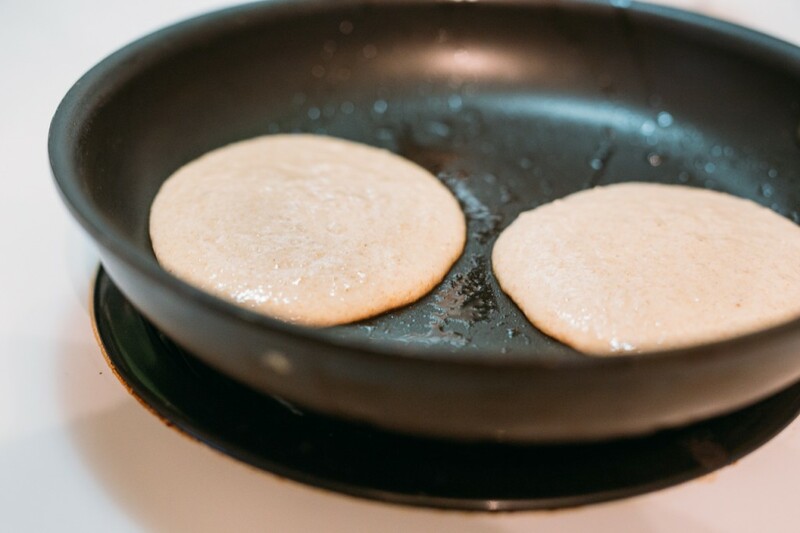 *Sometimes the pancake batter gets slightly thick between batches, soI add splashes of water or almond milk to keep it at the right consistency.